The Gift Box opened its doors at 310 West State Street in Geneva, Illinois in November of 1947. We are celebrating our 71st year in business in 2018! Edythe Anderson, daughter of Swedish immigrants, had a vision of opening a store selling Scandinavian items that she loved and cherished. Just after WW II was a difficult time to open a business but she always dreamed of owning a business and had saved enough after years of working to finally open her store. Edythe played a vital role in the Swedish immigrant community in Geneva during the 1940s and 1950s. 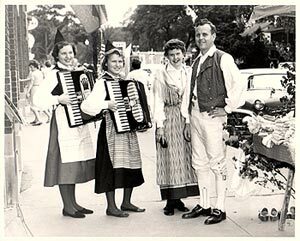 During those years the whole town of Geneva got into the spirit of Swedish Days, sparked by Swedish immigrants and their descendants. Lennart Jönsson started working at The Gift Box in 1954 after emigrating from southern Sweden to the Fox Valley. 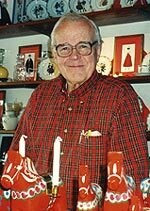 His knowledge of Sweden, Scandinavia and giftware was a great asset to the business. In 1965, Cole Travel Service was incorporated into the retail space and was in business up until 2012. In 1966 the store expanded to include the downstairs. Lennart took ownership of The Gift Box in 1984 when Edythe retired. His Swedish background and extensive knowledge of Scandinavian culture and history made him the perfect candidate for running the store. His ability to connect with people and his passion for all things Scandinavian has helped the store in its success. Customers knew him by name and stopped by frequently with inquiries about Scandinavia and to hear a good story. They appreciated his experience and expertise. It was not uncommon for people to come in and enjoy being able to “tala svenska” with Lennart. Today The Gift Box strives to preserve its Scandinavian heritage by selling products that are made in the Nordic countries. Hans and Maria Jönsson, the current owners, strive to carry a wide range of Scandinavian giftware to fit any size pocketbook. Customers enjoy seeing products they remember from their childhood, family history or their native country. Everything from Swedish clogs, crystal, Royal Copenhagen and Bing & Grondahl collector plates, to Carl Larsson related items, handcrafted gifts, antiques, jewelry, Scandinavian food, and much more. There is a strong desire for people to connect with their Scandinavian roots and our customers do this by purchasing our products to pass along time honored traditions to family and friends. There are several local Scandinavian events in the Fox Valley area. The first event is the Swedish Day Midsommar Festival (Midsummer in English) celebrated every year on Fathers Day at Good Templar Park on the east side of Geneva. www.swedishday.net Midsummer is an important seasonal event celebrated in Sweden on the 24th of June (June 21st is the longest day of the year, the Summer Solstice). Good Templar Park houses a replica of the “Gokstad” Viking ship which crossed the Atlantic in 1893 and arrived in time for the Columbian Exposition World Fair in Chicago. The park celebrated their 106th year of the annual event in 2016. It is a wonderful event for all Swedish enthusiasts complete with maypole dancing and some folks dressed in traditional costumes (if it is not too hot!). We highly recommend it to anyone who wants to learn more about Sweden. The second event is downtown Geneva’s annual Swedish Days Festival which starts the week after Fathers Day. www.genevachamber.com The festival first began in 1949 and is one of the oldest festivals in Illinois, celebrates it's 69th year in 2018. The six day long festival starts Tuesday night with Moonlight Madness and finishes on Sunday with the Swedish Days parade. Many people come to Geneva every year for the city wide midsummer celebration commemorating the arrival of the first Swedish immigrants in Geneva starting in the 1850s. Be sure to visit the Sweden Väst tent and attend the parade on Sunday. The third Scandinavian event is in September every year at Vasa Park in South Elgin, Illinois. The Scandinavian Day Festival will celebrate its 38th annual festival in 2017. www.vasaparkil.com This event is widely attended by all Scandinavian enthusiasts not just Swedes. They also have their own Midsummer Festival usually the Saturday before Fathers Days. Christmas is a special time at The Gift Box. In Geneva, the first weekend in December is the annual Christmas Walk and Swedish “glögg” is always served at our shop on Friday night. 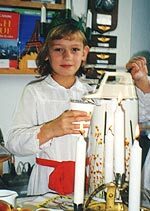 In years past The Gift Box always had a local girl dress as Sankta Lucia around December 13th serving coffee and lucia buns to our customers. Today Sankta Lucia is part of Geneva’s Christmas Walk event on Friday night, the official beginning of the Christmas shopping season in town. Be sure to check out all of the seasonal events in Chicago by going to the American Swedish Museum website. www.swedishamericanmuseum.org Usually Ebenezer Lutheran Church in Chicago has an annual Sankta Lucia church service. We look forward to your visit to our store! The Gift Box/Scandinavian Imports is celebrating 71 years in business in 2018.